For over 100 years Grant’s have created the finest quality haggis from a traditional Scottish recipe. This tradition of excellence has been handed down through the generations and Grant’s pride themselves on using only the highest quality ingredients to produce an authentic ‘Taste of Scotland’. Grant’s was founded in 1885 by two brothers who set up a family butchers shop in Glasgow. As the business expanded and developed, Grant’s relocated to Ayrshire in the heart of Burns Country. Today continue to make our products from fresh, local produce and our commitment to creating delicious, top quality food remains at the centre of everything we do. With over 40 products across several different ranges, we cater for every taste and budget. Grants tinned haggis can be purchased online here , their products are also exported globally to over 50 countries worldwide. All Grants products are free from artificial colours, flavours and preservatives, ensuring we provide you with delicious food and meals which are as good as homemade. Grants are continually working on creating exciting new product recipes to add to our range, from traditional Scottish dishes to internationally inspired cuisines. If you have suggestions let us know. 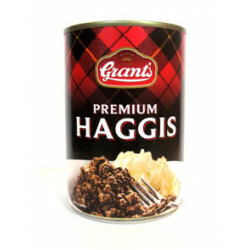 Buy Grants tinned haggis online here! Grants Tinned Haggis 392g tin, which serves 2-3Since 1885 Grants have been creating the finest quali..
400g tin, which serves 2-3.INGREDIENTSVenison (23%), Lamb Lobes, Oatmeal, Scottish Water, Lamb Suet,.. Grants Whisky Flavoured Haggis 410g tin..